Over the years I've spun records on all sorts of set ups. Lugging speakers at tall as I was in a 1982 VW drop top rabbit. But one name always brought delight to me ear and the struts on my car. Small loud and rugged as hell. These speakers were king. Now I'm back or looking to be back and the first bar we find has no PA. This I'm surfing the www looking at live sound again. With everything else I'm pushing new grounds for me as a DJ. Using Serato, buying a DJ stand, now owning speakers. What happened to the old days where all you needed was you records. BA Ha. So the question remains Mackie or no Mackie? The other day I switched up my headphones, I'm not sure why I guess cause I was lazy and did not want to walk up stairs to nip them out of my bag. When I threw on this next closest pair of head phones on I was shocked at the fit, the sound and a few other "added features". Thus prompting this review. *** NOTE: All the reviews stated here are my options. I'm not sponsored, no one gives me kick backs and the fact that they are all Sony Products... well its cause those are the only headphones I've spent my hard earned money on. Cheers. 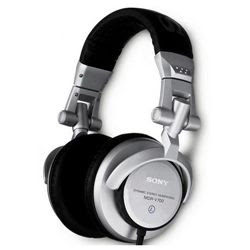 For years I've exclusively used the Sony MDR-7506's. In college I aspired to take as many audio classes as I could without being an audio major. Music is my hobby not my life. My instructor that I looked up to a lot recommend the MDR-7506's and I did not look back. The fit, sound clarity and unique nature of them in my local DJ community made them a perfect match. Also the fact that if they ever fell apart I could take them apart and hot wire them. My first pair lasted 7 years of college, DJ gigs and international travel. So when I had to retire them I was a little bummed, (yes I did resurrect them and still use them to this day). When I head to retire them it was unfortunately just before a gig, (I slammed them in a car door 2 hours before). So I bussled down to a local music shop in Columbus Ohio and picked up my first MDR-7509. This was my "back up" in till this year. During this time period I mainly used them for day to day office reviewing of my music files. I found their fit to be loose, the sound to be very bass heavy and the plastic foam coating to be annoying especially as they started to disintegrate and flake off. Most recently for Christmas my better half bought me a pair of MDR-V700DJ. She did so with the hopes I would use the one cup on one cup off functionality so she could talk to me while I was DJing. 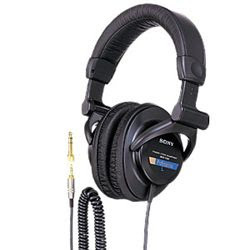 At first I was unimpressed with its fit, sure it was firm and snug but it lacked the encompassing feeling the MDR-7506's had. But as I started using them more and more this became less of an issue. The over all construction of the MDR-V700DJ are sturdy and ment to take a beating that daily use can bring. Pho-Leather was used to cover the cup foam padding insead of that annoying plastic foam coating, over all beefy construction, and easy to take apart and mod. However, I've already found their weak point: beware of their hinge that allows the cup to rotate. Its possiable with out much force to snap the little plastic clips that stop the cup from being allowed to rotate 360 degrees. I watched a set get droped by a kid at a local DJ store from about a foot and a half from the surface it slammed in to. When it was my turn to preview a few records the head phones almost feel apart in my hands. Besides that little flaw the clearity is modest and has been a nice addition to my headphone quiver. I started working on one of my goals for the year. Actually djing with Rane Scratch Live. Up till now I've been using it for sampling and toying around with it. A hand full of things I've learned. 1) you can have to much music. From what I can tell my 500,000 song library in iTunes seems to crash the "build overview" function. 2) you can't read the coded records to tell you how much time you have left. I never realized how much I used this in my DJ practice. Thus I kept running out of track. This in no way is a problem with the program... More a learning curve as I start to use this new format. So why now? Sure it's a goal of mine to start moving this direction. But the spark came from the closing of the DJ Hut. The last of the exclusive dance music record shop. Sure the are heading online... But every DC record shop that has gone on line has failed. Yoshie Toshie, Capital City Records both fizzled out and from what I understand Dj Hut is not looking to improve their already poor user interface and information architecture. I hope the DJ Hut proves me wrong, I hope the dc DJ community continues to support DJ Hut during these new and rugged times. ***NOTE: i would like to comment that I will continue to buy my records from DJ Hut. However this means they are put in the same level as Juno.co.uk, hardtofindrecords.com and all the other online record stores. I have local pride but I have that pride because of my interactions with the staff and patrons of DJ Hut. This lack of interaction and personalize emotion that I experience with online shopping is very much like the impersonal emotion I feel about playing mp3s. I guess this is just another learning curve. So here's to the future and here's to old friends. Catch you on the flip.